← Sushi & Yum Cha. What a combination. We own two cats, one of which is a large ginger cat named “Ginger”. I know, pretty obvious, however he was named that as the day we got him he was referred to as “the ginger cat” and it seemed to fit. Ginger likes to do “ninja” sprints through the house, and is very adept at scaling his climbing toys. 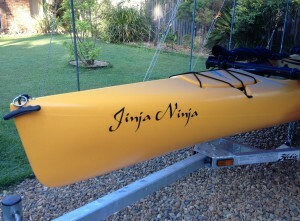 Once we got the sailyak, given it was large and yellow, we started referring to it as the Jinja Ninja and pretty soon others began to use that name. Sometimes naming something can be as simple as what feels right. We decided to make it official with a decal after doing our marine radio course. During the course the instructor talked about the need to include the vessel name when radioing. Of course, as a kayak, we don’t register our boat and so have no official registration number we can use. The obvious thing to do is defer to her name. The guy taking the course suggested that if the boat had the name on it, then in an emergency, they could identify that they had located the vessel that had made the call. So if you do have a name for your sailyak, it’s worth considering getting a decal made up for it.